Energy analysts believe oil market volatility will continue until the build-up in U.S. crude stockpiles reverses. 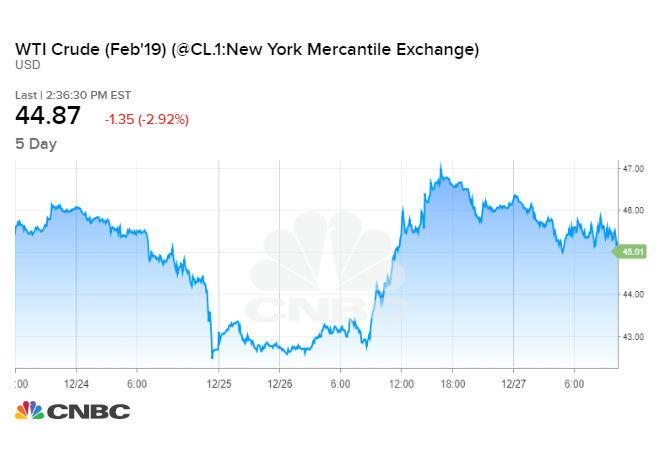 U.S. crude fell to an 18-month low on Monday, only to post its best one-day performance in more than two years on Wednesday. The oil market is under the thrall of macroeconomic factors that are weighing on the stock market and raising questions about crude demand in 2019. Oil field workers on a rig in Tioga, North Dakota. Investors hoping for serenity in the New Year should probably avoid the oil market. Energy analysts say the volatility gripping the sector is likely to continue beyond the holidays. The oil price moves this week have been spectacular even for a market that has seen the cost of crude spike to nearly four-year highs in early October and lose almost half of its value by late December. U.S. West Texas Intermediate crude plunged to an 18-month low at $42.53 on Monday, shedding more than $7 a barrel in just five days. On Wednesday, the contract rallied nearly 9 percent to $46.22, posting its best daily performance in more than two years. By Thursday, U.S. crude was once again deteriorating, slipping 3.5 percent and falling back below $45 a barrel. To be sure, the wild swings can be explained in part by thin trading during the week of Christmas. Tamar Essner, director of energy and utilities at Nasdaq Corporate Solutions said "the low liquidity during the holiday week is exaggerating the volatility and causing irrational price action as the market has no confidence about anything now." However, investors may have to endure the roller coaster ride even after traders return to their desks, according to Dominic Schnider, head of commodity and Asia-Pacific forex at UBS. "I think the volatility in the short term is here definitely because we need some confirmation" that prices will rise, "and that confirmation ultimately comes from inventory in the U.S. going down further," Schnider told CNBC's "Squawk Box" in Asia. Stockpiles of crude held in the United States began building up in September. They now sit about 7 percent above the five-year average for inventory levels. Stocks began ticking lower four weeks ago, but the oil market needs to see a stronger downtrend before it rallies, says Schnider. "Once we get that confirmation somewhere in the first quarter I think the volatility in the oil market should come down, and that's why it's the time to position towards higher prices" he said. Investors might not have to wait long to see U.S. crude inventories fall, even though production cuts by OPEC, Russia and several other oil producers don't go into effect until Jan. 1. Helima Croft, global head of commodity strategy at RBC Capital Markets, says Saudi Arabia's decision to withhold crude exports into the U.S. will play a critical role in shrinking inventories and boosting oil prices. Saudi Arabia has been loading fewer barrels on vessels bound for the U.S. in recent months, which should lead to a drop in U.S. inventory levels. That is crucial to market sentiment because U.S. stockpiles are the most transparent and closely watched inventories in the world. For the moment, however, analysts say crude appears to be following the equity market, where volatility is also high, in part due to macroeconomic concerns like rising interest rates and trade tensions, as well as political turmoil in Washington. "We had no bullish catalyst yesterday. It was just basically following the market," Croft told CNBC's "Squawk on the Street" on Thursday. "I think oil has been dragged down by these broader macro concerns, but at some point I do think fundamentals should reassert themselves in this market." For the moment, investors will have to abide the macroeconomic factors buffeting the stock market and feeding the perception that demand for crude oil will be soft in 2019, says John Kilduff, founding partner at energy hedge fund Again Capital. Kilduff believes the catalyst for a divergence in equities and crude oil could be the resignation of U.S. Secretary of Defense James Mattis. His exit removes a moderating voice from an otherwise hawkish administration, which could boost oil prices even if equities tumble. Specifically, Kilduff says the administration could be emboldened to take a tougher stance against Iran, OPEC's third biggest producer. One catalyst for the oil market slump is Trump's decision to allow several of Iran's biggest customers to continue buying crude oil from the Islamic Republic despite U.S. sanctions. Anticipating strict enforcement, Saudi Arabia and several other countries hiked production before the sanctions snapped back into place last month. That pushed the market deeper into oversupply. The emergence of a "hard right-wing group" led by National Security Advisor John Bolton lends credence to the view that Washington will impose strict sanctions on Iran when the import waivers expire around the beginning of May, Kilduff told "Squawk on the Street."